In a previous post HynoBirthing Part 1: My Birth Story, I wrote about my birthing experience with both my kids. There are mixed point of views on what moms envision as their ideal birthing experience. For me, a vaginal birth was what I dreamed of. Unfortunately, it wasn't in the cards for me in both instances. I am still learning to cope with this upset. As others would say, I have two beautiful and healthy children and that is ALL that matters. And that is true. To this day, I still get the warm and tingly sensation in my heart when I look at them. I totally thought this 'cloud nine' feeling would die off over time but nope, it grows stronger by the day. I am always grateful. As someone who was never able to conceive a baby naturally, being able to have them is a complete miracle. There are no words to describe how lucky I feel each and every day. But a part of me still wonders and dwells on the past...What if I better prepped myself? What could I have done differently in the moment? First up. My best friend Berlyn. She was able to execute her HypnoBirthing practice on both occasions with both her girls. She felt calm, relaxed and supported throughout her delivery. Q: How would you describe HypnoBirthing and what made you want to learn it? Berlyn: A form of self-hypnosis that allows you to relax and be in control of your child's birth. It focuses on various breathing techniques to manage through pain and anxiety. During my first pregnancy, I heard about it through two friends on separate occasions who both had nothing but positive things to say about it. Before we became pregnant, I was sure I would just take the epidural, but after I actually got pregnant, something changed in me. I started thinking that for centuries, women have been birthing naturally without any drugs, so I thought why can't I? And the rest was history. Q: What did your husband think about the method when you first told him about it? And what does he think of it now? Berlyn: At first, he didn't know anything about it, so he kind of thought it was a gimmick. Now, he would also recommend it to other couples. But we both know that everyone manages pain differently, and everyone's birthing experience is very unique. Q: Would you say you were able to successfully implement HypnoBirthing during your entire delivery process? Berlyn: Yes! Although I wasn't able to fully breathe my babies down through the last stages (on both birthing occasions), the other techniques I learned helped me through the rest of the experience. For both of my daughters' births, my labour was able to progress naturally, and this was a huge factor in enabling me to successfully manage both births through HypnoBirthing. Q: What words would you use to describe your overall birthing experience? Berlyn: Peaceful, smooth, calm, relaxed, positive, supported, safe, in control of my mind. Q: What part of HynoBirthing did you find most useful during delivery? Berlyn: The breathing techniques through the surges (or contractions), the positive mindset that we practiced throughout the course and beyond, the calm music that played for hours and hours during my first child birth! Q: If a friend was to ask you if you would recommend HynoBirthing, would you and why? Berlyn: Absolutely without a doubt! I had such a positive experience with it, and I was very blessed to have been able to deliver naturally both times. I know, however, that circumstances can change through one's labour and ultimately, you and your partner need to do what's best for mother and baby. HynoBirthing is really about the tools to help manage through the anxiety of a new mom and the unknown. For me, it was about learning to trust that my body and my baby know what they need to do, and for me to be ok and not afraid of it. Even if you're unable to do birth naturally in the end, it will help you stay relaxed and trust yourself, your body and your baby. Eva was able to give birth naturally at home with the assistance of a doula and midwife. Her husband, who was skeptical at first, was totally on board. Their feedback? They would do it all over again if and when they have a second. Q: What made you want to learn HypnoBirthing? Eva: It was actually my doula who told me about it. It all started during one of our meetings when she asked me and my husband Gary to do in a mini experiment. We each held an ice cube in our hands while she timed us. As soon as she said the time was up, Gary immediately dropped the ice cube into his empty bowl in pain and discomfort. On the other hand, my reaction was the opposite; I just casually let go of the ice cube and wiped away the water that was in my hands. She then asked us what was on our minds when we were holding the ice cubes. Gary said, "I just kept thinking when it would be over." Meanwhile, I just kept visualizing myself in the heat under the sun, which helped me cope with the pain. It's interesting how we responded differently to the exact same experience. Anyway, after that mini experiment, my doula felt that I could benefit from HypnoBirthing and suggested that I look into it. Q: How did you learn it? Eva: Gary and I took the 5-week course and each class was about 2.5 hours long. The instructor provided me with a copy of the HypnoBirthing book by Marie Mongan and in class, we got additional handouts and guided meditation tracks to practice at home. I found the book a bit boring and there was no way I could have implemented the techniques on my own without a teacher guiding me. And it would have been very difficult to explain the concepts and exercises to Gary myself. I felt it was really important that we took the course together so that he could support me during pregnancy and labour. I enjoyed the classes but I met a couple who took the course elsewhere and thought the 2.5 hours was way too long. I guess it depends on who is teaching it. I thought my instructor was very knowledgeable and had a great sense of humour! Q: What did your husband think about the method when you first told him about it? What does he think of it now? Eva: He was skeptical at the beginning because his first thought was, "Are we going to get hypnotized with a pendulum like how they do it in movies and on TV?" :) Now, he definitely thinks it worked for us because we ended up having a successful home birth! In fact, we originally planned to have a hospital birth so that I would have the option of getting an epidural if I felt I needed one. However, after taking the course and weighing all the pros and cons, we eventually felt confident enough to do it at home. At the same time, we had a lot of support from my doula and midwives; we couldn't have done it without them! Q: Would you say you were able to successfully implement HypnoBirthing during delivery? Eva: I would say yes! Even though my birthing experience was nothing like the ones in the videos presented in class, I really do think HypnoBirthing prepared my mind and body and helped me get through labour. I even had all my bags ready in case I needed to be transferred to the hospital. I was 100% ready for childbirth regardless of how it was to unfold! Fortunately, I ended up giving birth to a healthy baby girl unmedicated at home and when she arrived into this world, she was calm and alert! If we have a second child later, I would do the same thing all over again! Q: What part of HypnoBirthing did you find most useful during delivery? Eva: Of the various breathing techniques we were taught, the most useful one for me was the "surge" or "balloon" breath because it really helped me cope with the pain each time I experienced a surge. Doing the surge breath gave me something to focus on instead of thinking of the pain and when it was going to end. Q: If a friend was to ask you if you would recommend HypnoBirthing, would you and why? Eva: Yes, definitely. In fact, I even convinced one of my friends to do it with her husband not too long ago. 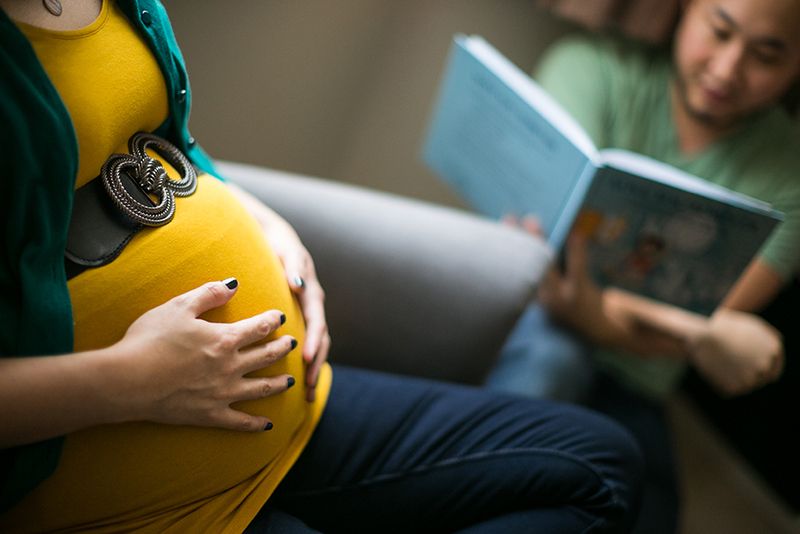 HypnoBirthing can benefit families in different birthing situations regardless of how labour unfolds; this includes women who end up having a C-section. What HypnoBirthing has taught me about childbirth is that it shouldn't be feared and more importantly, to stay positive and to make the best of what happens using the techniques taught in class. Being a mom and a business owner, I have learned to embrace the chaos, to live spontaneously without expectations, to make choices that are beyond what others would call 'normal'. And along the way, I have been rewarded with many unexpected surprises and failures (yes, failures are rewards in disguise). I am a life learner and I like writing. And this is my blog where I can share both.